The family told Amandala that the children were walking home after watching television at the home of a neighbor when the woman approached and took them, reportedly on Tuesday, July 16. Felix Romero, the father of the children, who neighbors say is a good provider and a loving father to them, told police that he believes that the children were kidnapped by their grandfather, Juan Evangelista Jovel, who lives in El Salvador, but has visited them frequently over the past two years. The children were sighted in the Pomona Valley area in the company of an older man who the father believes is their grandfather, Jovel, who may be trying to take them out of the country to live with him. The mother of the children, we were told, is a naturalized Belizean from El Salvador. The children were living with her while their father, Felix Romero, who lives and works in San Pedro, sent money to support them. Their mother and father are not together, and the mother reportedly has a boyfriend. The mother told police that she did not report them missing immediately because whenever they went to the neighbors, they would return, and she was not initially worried because she felt assured they would be taken care of. Police said that Felix Romero is a responsible father and had nothing to do with the children’s disappearance. They also do not have a clear understanding why the grandfather would have taken the children, except for an allegation that the children were not well kept. According to Romero, the children were last seen Thursday at a relative’shome in Silk Grass Village, Stann Creek, in the company of a female stranger and their grandfather, Jovel, who is in his late 70s. Reports to Romero were that the children stayed at Jovel’s relative’s home under the pretext that they were on their way to the clinic in Dangriga to seek treatment for Fanny, who was suffering from an infected ear piercing. 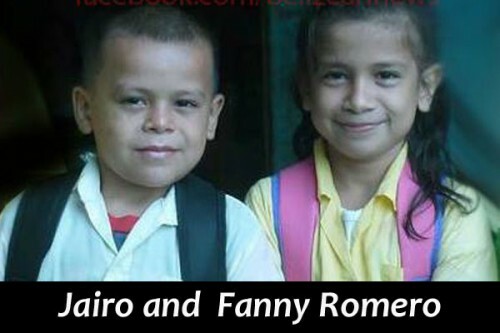 Jairo is described as having straight blond hair, while Fanny’s hair is cut short. She was last seen wearing a brown cap. They are both of fair complexion. Jovel, their grandfather is short, fair-complexioned and stout. The woman accompanying the children is of Maya descent, and is also short and stout. The police are seeking the public’s assistance in finding the children. Anyone who knows the whereabouts of the children or who has information that could lead to their safe return is urged to call the nearest police station or 0800 – 922 – TIPS, or Felix Romero at 624-4051.